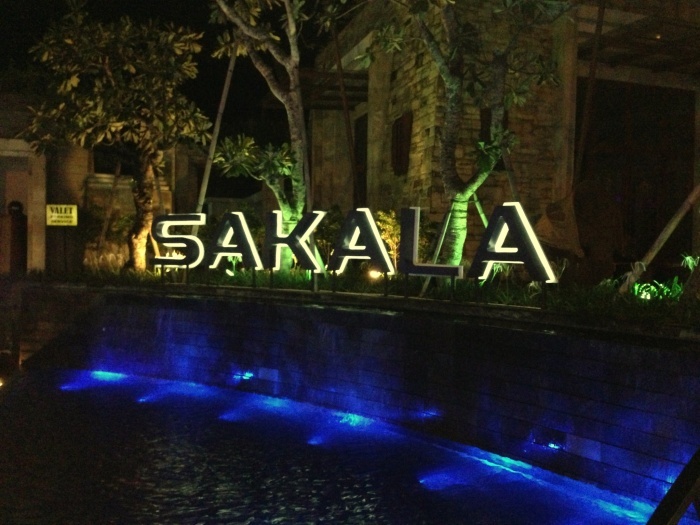 Halfway through our week in Bali, we decided to embark on a bit of a culinary adventure at Sakala. As Bali Eats named it Bali’s best new fine dining restaurant in 2011, the menu made our mouths water and it was located just up the road from the hotel – it seemed rude not to visit… and just in case you’re wondering, this isn’t a sponsored post. It’s just an excellent eating experience I wanted to share! 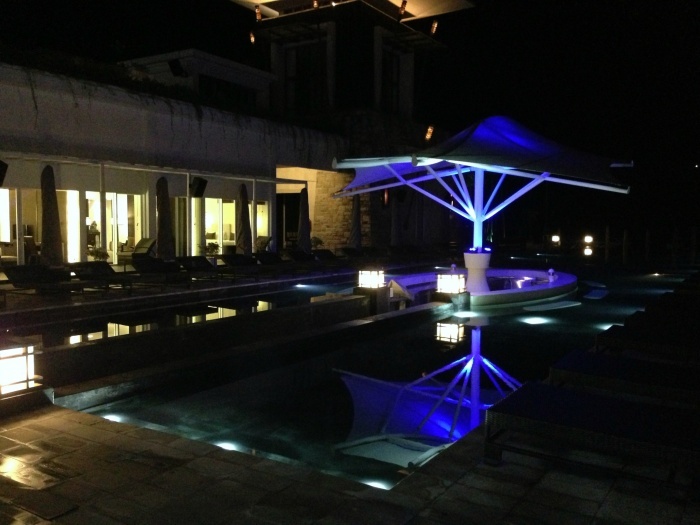 The Nusa Dua area is pretty spread out with hotels and restaurants and Sakala, like many other local eateries, offers a free pick up and drop off service at the hotel. We had a driver and a greeter and were given the VIP treatment from the get-go. By the time we got to the place, we felt like rock stars, with a complete crew of staff to welcome us (by name) and take us into the restaurant. The whole shebang has been designed by a famous Thai architect, and the restaurant is going to be part of one of Bali’s most exclusive and upmarket resorts, due to open late 2013. This place is sleek, smart and very contemporary. There’s a DJ playing some smooth tunes, there’s a climate controlled wine room big enough to make our eyes pop out on stalks and, the decor is very, very tasty. The Sakala people have thought of everything! We had our own waiter who was like the genie of the lamp, our wish is his command. Then there’s other wait staff, some to serve the food and explain each dish, some to deliver drinks and some to give cutlery. The service was second to none, super attentive but not intrusive. I freaked out at first, because we were the only diners, but were later joined by another couple. I don’t know where everyone else was eating, but they were seriously missing out. 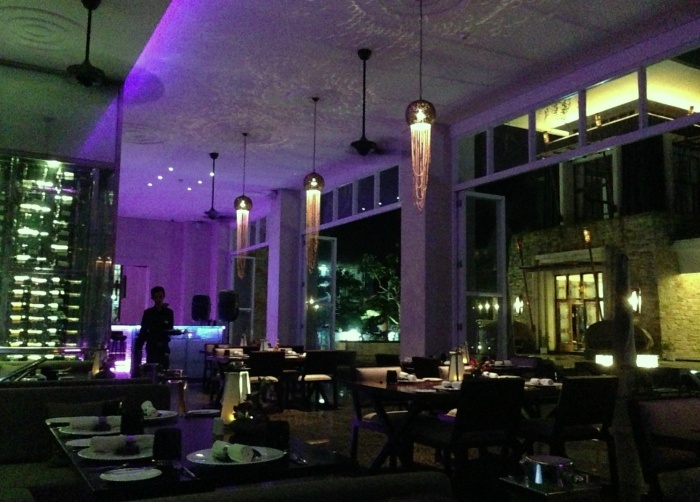 The food is modern French and thoroughly delicious. Choosing our dishes was incredibly difficult because we wanted to eat everything. First off, there was an amuse bouche of curried shrimp topped with mango coulis which tasted amazing. Don’t get me started on the assortment of freshly baked bread. Once I start raving on about how warm and delicious it was, I might never stop! 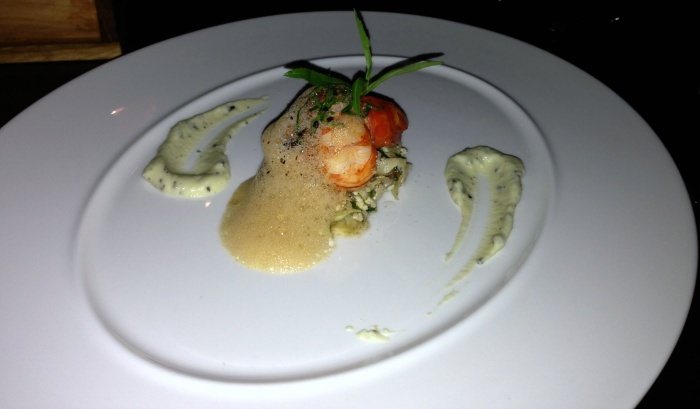 To start, David had the River prawns with crushed cauliflower salad and young spinach, creamy shellfish foam, truffle vinaigrette and micro greens. The prawns were soft and succulent and the shellfish foam added an unexpected creaminess to the dish which balanced beautifully with the vinaigrette. I opted for the Queen scallops fresh from Java and served five ways: provencal, truffle, vanilla-orange, caviar-bisque and lemon-olive oil. 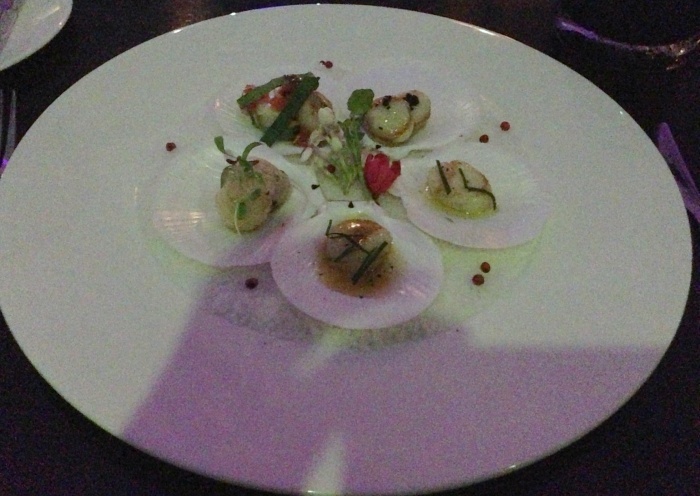 I loved the exquisite presentation of each little scallop in the shell each with an excitingly different flavour. It’s the way I love to eat, tasting a little bit of everything. 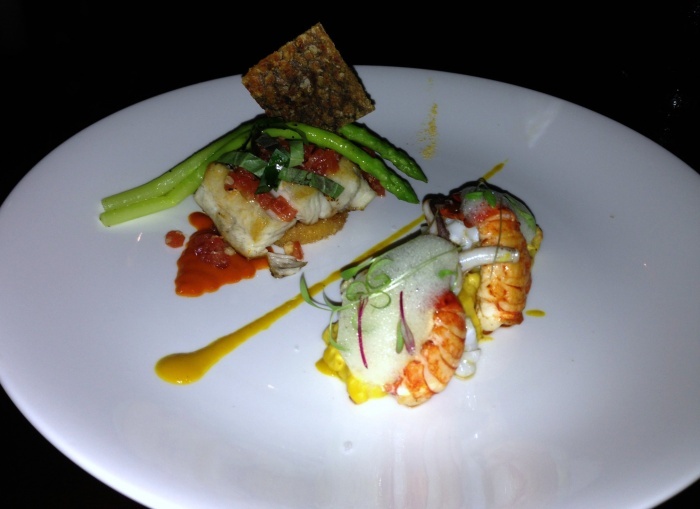 David loved his main; pan fried barramundi with river lobsters and fresh squids served with sweet corn ragout and chorizo vinaigrette, bread crumb risotto, bell pepper coulis and micro greens. The barramundi was delicious and cooked to perfection, the river lobsters were soft and tender, although the corn ragout was a little under seasoned for his tastebuds. However, the flavours of the dish all worked well together. I loved the Tasmanian Salmon (cooked sous-vide) with slow-cooked endive and oyster mushroom, zucchini velouté, asparagus, young potato, arugula, vine-ripened tomato and orange-balsamic vinaigrette. It was served on a big wooden board, and it looked amazing. Nice dish, shame about the photo! The flash was not my friend, so believe me when I say, it tasted as good as it looked, and then some. The salmon was cooked perfectly and the flavours were fabulous! 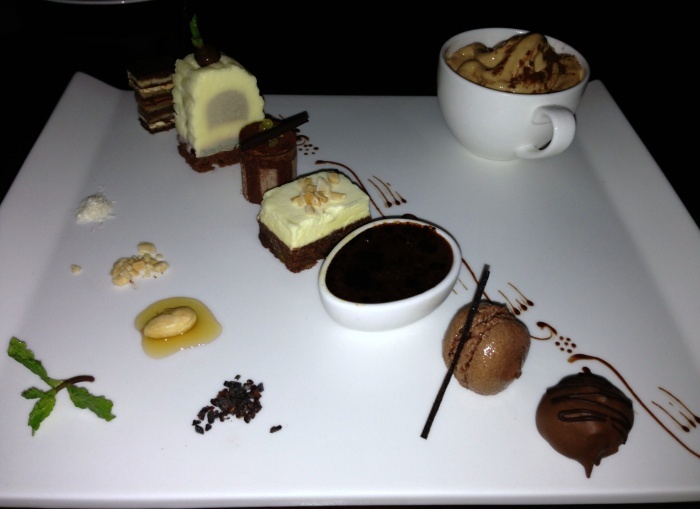 Sakala is famous for it’s signature dessert – Chocolate; which is basically Valrhona grand cru chocolate, 70% bitter, served 7 ways. It’s not for the faint hearted but it is for chocaholics, so of course, David was right in there! As I’m always watching my waistline, I usually steer clear of desserts, but this March there’s a special offer, buy one Chocolate dessert and get another dessert of your choice free! Well, it would have been rude not to! 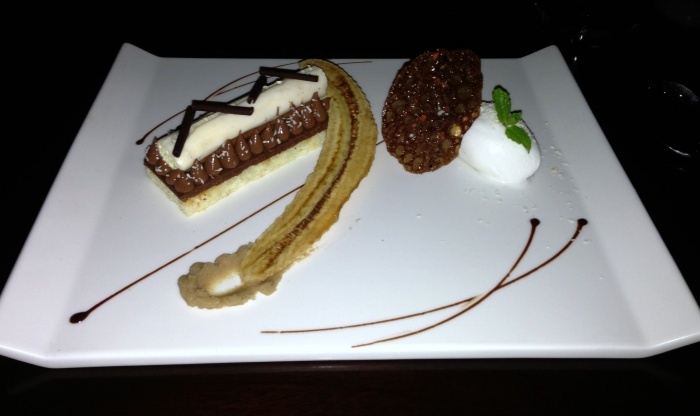 All the desserts looked delicious, but I chose Bounty; a guanaja chocolate bar with coconut cream filling and sorbet, biscuit joconde, crunchy hazelnut and banana paste. It was like a banana, chocolate and coconut taste explosion. Coco-licious! We wrapped up the evening with coffee and some super cute marshmallows which was a sweet end to an excellent evening.